Fans of the show cheered on Jacky as she confronted a drunken Jake on Thursday night's "Halik." 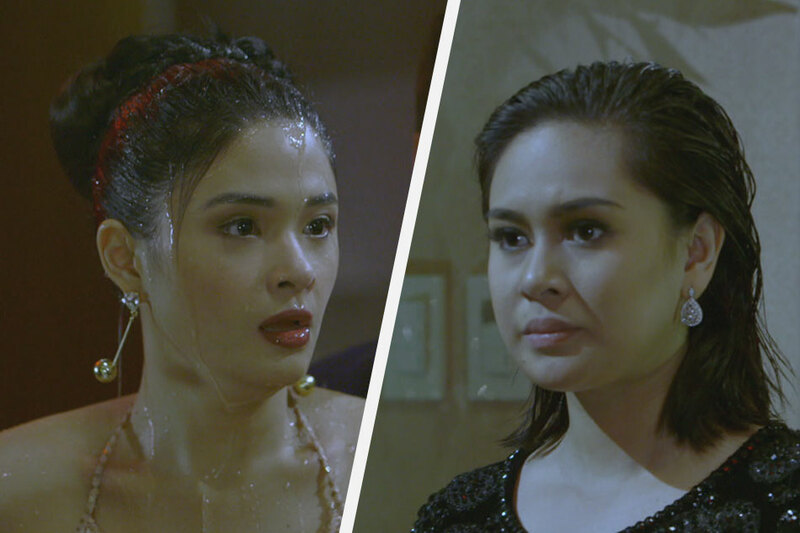 Viewers of "Halik" left Ace (Sam Milby) in a defiant mood last episode, convinced that bringing Jade (Yam Concepcion) to a party where he needed to make a good impression was a smart thing to do, because if anything it'll help calm her mistress' insecurities about fitting in among the rich and the famous. On Thursday though, Jade pushes his patience a bit too far by making a drunken fool of herself, and it'll be difficult to see him trusting her again after this. Ace needed to get on the good side of the big shot businessman who was looking to put up a new hotel and casino. Not only will doing so score his company a huge profit, it'll also mean one less client for their rival, Lino (Jericho Rosales). It was already going badly for him after Lino's impassioned speech about his company's humble beginnings and their dedication to improve the lives of their workers, but it turned into a full blown disaster when a jealous and alcohol-driven Jade storms in. Unwittingly sabotaging any ounce of chance Ace had left, Jade barks at the wife of the businessman, carelessly throwing insults. Ace finds a surprising ally in Lino, who emotionally tries to save Jade from further embarrassment and pleads for her to go home, as well as in Jacky (Yen Santos). Though seeing Ace with his estranged wife Jacky did more bad than good for Jade's fragile ego, and she goes on a tirade about she's better than her. "Ikaw, babae ka? Akala mo ang ganda-ganda mo? Pero dibdib lang ang mayroon ka. Pero ako, mula ulo hanggang paa, panlaban na. Tingnan mo nga ang sarili mo sa salamin," Jade said. Jacky, who swore revenge on Jade for stealing her husband, would have the last laugh though, after grabbing a pitcher filled with cold water and pouring it all over the drunken Jade. It was the scene that had its viewers talking on Twitter, making it the top trending topic even an hour after the episode aired. Some were embarrassed for Jade, while the majority was delighted that she finally got her comeuppance. Jericho throwing those cold lines gaya nung confrontation with Jade and now with Ace. You're still in the lead of the long lines of best actors Jericho Rosales! #SalpukangHalik Ace made the biggest mistake by bringing the leech. Lino, on the other hand, realized one thing… that Jade is not worth keeping.